What we have here is another Macro Minimalism Photograph. 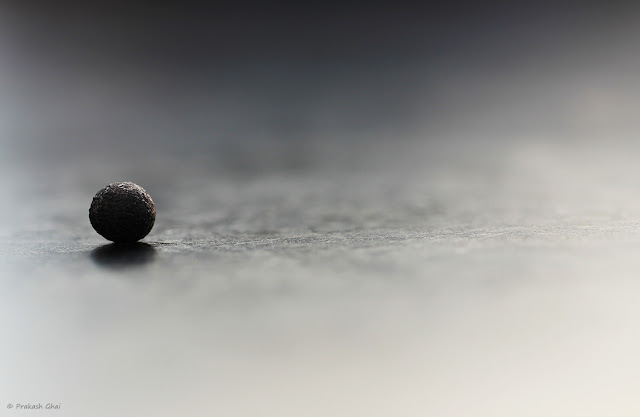 The Subject, is just a small round Black Ball that I picked-up under my Coffee Table. The table was covered elegantly with a glossy silver mica. The light was coming in from the front and behind me there was a big white wall. What I found interesting here, was the small little reflection of the Black Ball being created on the silver-ish and smooth surface of the Coffee Table. I had my Macro Lens on, and it took me about 4-5 shots to get this right. I was on Full Manual Camera Settings with Both the Camera and Lens's focus settings set to Manual as well. Since I wanted to emphasize the Black Ball's Reflection, I placed the subject only following the left rule of thirds, and avoided the bottom rule of thirds alignment. As you can see, the Black Ball is near the center row of the rule of thirds grid, while its reflection slips towards the bottom row. This Minimalist Photo falls under the Minimalism as in Small Objects category of Minimalist Photography. The intention is clearly to show its small size, against the large empty spaces. To enhance emphasis on the subject, a lot of Negative Space has been used.